ACDelco is now distributed in the Philippines by Thunder Automotive, the country’s leading source for original dealer-only parts, and is now set on making ACDelco’s wide product range readily available nationwide. With a range that includes over 90,000 products across 37 product lines, this ensures distributors access to a market that encompasses the majority of Philippine automotive consumers. It also offers a wide range of high-grade oils and chemicals for optimal vehicle maintenance. ACDelco Oils & Lubricants: an innovative line of engine oils including efficient and cost effective mineral oil, semi-synthetic or 100 percent synthetic oil, and the flagship Dexos line. All of which are designed to keep engines in peak performance through optimal wear protection with the stringent ACDelco Process Controls and Quality Checks system. ACDelco Battery: with heavy-duty Sealed Maintenance Free (SMF) batteries, ACDelco guarantees customers’ safety, preventing explosion from sparks outside the battery. The use of lead calcium grids provide convenience and durability while successfully minimizing corrosion and water loss. This effectively requires zero maintenance within a 12-month shelf life without charging. 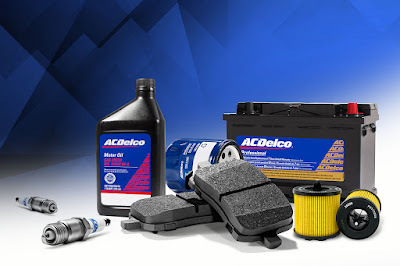 ACDelco Chemicals and Cleaners: from brake oils, coolants, carburetor and fuel system cleaners, to transmission fluids, ACDelco offers a full range of car care system products designed to completely enhance vehicle maintenance both inside and out. Wiper Blades: their brand of wiper blades are aerodynamically engineered to clean whatever is thrown at your windshield. It features even pressure distribution, longer rubber life cycle with easy installation, streak-free cleaning and optimal durability. Spark Plugs: the historic tradition of excellence first began with the spark plug in 1908 which helped ignite the company’s long standing reputation for quality. ACDelco spark plugs offer unparalleled design that can be adapted to each consumer’s needs, whether it be an older vehicle or the platinum performance linefor the latest models. Other Parts: ACDelco also has an arsenal of GM Genuine Parts and ACDelco Original Equipment Parts engineered for Chevrolet, Cadillac, and other non-GM car models. It offers an extensive range including air conditioning parts, filters, brakes, water pumps, struts, shock absorbers, and more. Thunder Automotive Parts Inc. is located at 919-B Luna Mencias St. Addition Hills, Mandaluyong City. For more information please call 63 2 721 3841 or 63 2 721 0885.